The History of the Bicycle is fraught with unknowns and confusion that a yearly Bicycle History conference is held in an attempt to clarify these details. Currently in its 28th year. The bicycle celebrated its 200th birthday in 2017. Invented by Karl von Drais who travelled to Mannheim for the first time on June 12 1817 the dandy horse or “running machine” as it became known (because it had no pedals, steering mechanism or brakes, was propelled by the rider pushing himself along with this feet on the ground; making it difficult and dangerous to manoeuvre) was the basis for the development of the bicycle, the world’s most successful mode of transport. 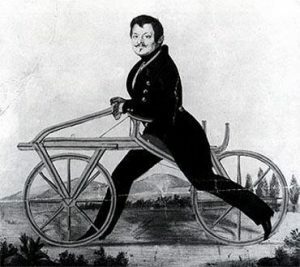 At first, it was called a velocipede, later becoming known as the bicycle from the French word “bicyclette”. Continuously re-invented it connects the past to the future combining technology, culture, tradition and history. The next evolutionary stage has now been reached; electrification and automation. The eBike! A trailblazer for the mobility of the future and one of the most successful electronic vehicles worldwide; bicycles save over 238 million gallons of fuel every year. There are estimated over one billion bicycles throughout the world. They are used for transport, recreation, competitive racing, courier delivery and many other tasks. The energy required to cycle at low to medium speeds is roughly the same as the energy required to walk, yet travelling three times faster. No other living being is able to put in so little energy for so much self-powered travel! A bicycle can stay upright without a rider as long as it’s moving at 8mph or faster. The most expensive bike ever a Trek Madone or the “Butterfly Bike” designed by artist Damien Hirst, was auctioned at Sotheby’s for $500,000. Built and ridden by Didi Senft from Germany the largest bicycle has a wheel diameter of 3.3 m (10 ft 9.92 in). The smallest bicycle ever made has wheels the size of silver dollars. The longest tandem bike ever built had 35 seats and was about 67 feet long. 268 km/h was the fastest speed achieved on a bicycle; ridden by Fred Rompelberg in 1995; on flat terrain and with the help of a pace car removing wind turbulence. A recent psychological study conducted by ‘Mindlab’ found that cyclists have a unique blend of intelligent generosity (“The cool factor”). A great reason to get on your bike!